About Mystic Valley Lodge A.F. & A.M. « Mystic Valley Lodge A.F. & A.M.
About Mystic Valley Lodge A.F. & A.M. 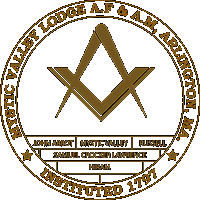 Mystic Valley Lodge of Ancient Free & Accepted Masons is currently the only Masonic Lodge meeting in the town of Arlington, Massachusetts, and boasts members from all of the communities surrounding the Mystic Valley lakes and rivers in the northwest area of the Boston metropolitan area. Mystic Valley Lodge was created in November 2004 through the merger of Hiram Lodge, Russell Lodge and John Abbot Samuel Crocker Lawrence Lodge. Each of these lodges has a long history in the communities of Arlington, Medford and Somerville. Mystic Valley Lodge meets regularly on the 2nd Tuesday of each month except July and August. Regular meetings are held in the Arlington Masonic Temple, at 19 Academy St in Arlington. For more information, contact the Secretary at secretary@mysticvalleylodge.org.